When I heard that BBC3 were airing a new mini-series focused on the development of a girl’s anorexia nervosa, I was sceptical (to put it mildly). Why do we need yet another depiction to add to the parade of skeletal women on television dramas who ultimately all end up on pro-anorexia websites? What could we possibly have to gain from such a programme? 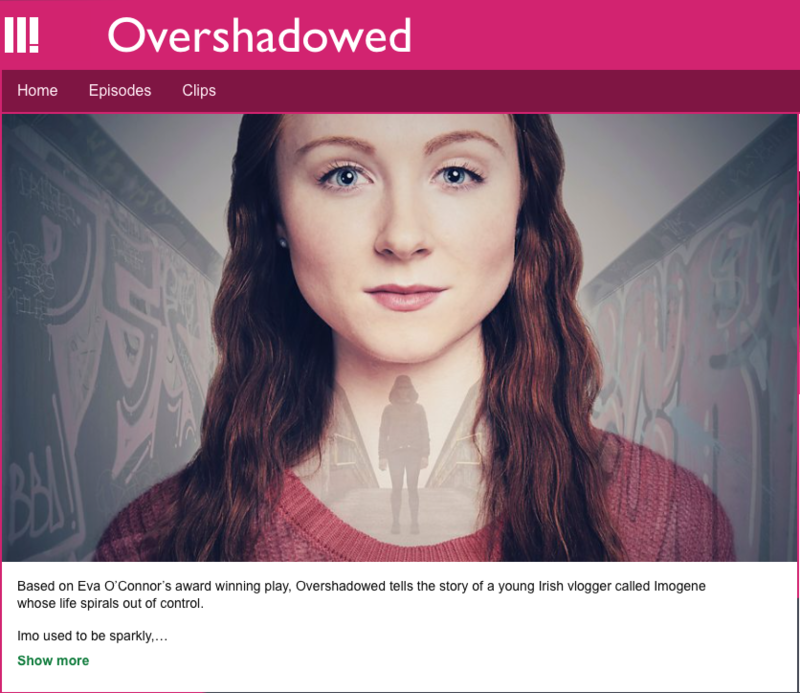 I watched Overshadowed in one enthralled sitting and, it turns out, quite a lot. Eight sharp ten-minute episodes are filmed like a YouTube vlog, with the main character Imogene (Michelle Fox) talking directly into the camera, addressing her followers. In the first episodes the narrative revolves solely around Imogene’s life pre-anorexia. She laughs with her sister and mother, giggles at the fat under her arms, and boldly tells her new followers that she is set on starting a ‘new life’ of fitness and clean eating. It all seems pretty harmless. She puffs along on a 5k run and jokes about how unfit she is. She is gawky, likable, and (as an actress) wholly believable. Imogene’s anorexia is personified. Eva O’Connor (who also wrote the drama) plays the illness and taunts her throughout the series. Her character, aptly named Anna, is given no introduction (so much so that I had to flick back through the episodes to figure out when we first meet her). Her omnipresence becomes eerie as the episodes progress. Anna is the perfect embodiment of Imogene’s eating disorder – cruel, calculated and manipulative. However, perhaps more crucially, she acts as a friend and confidant, convincing her to ignore the advice of others and accompanies her on her pursuit of thinness. Whilst this clever dramatisation gives the viewers a deeper insight into eating disorders, it also narrates a wider societal idea. Imogene’s eating disorder is an entirely separate entity to her. A separate body, with separate ideas and beliefs. The illness is not the person. Therefore, it diminishes any notions of stigma or blame from the outset. It is also good news for psychologists, as it is very much in keeping with accounts of a separate ‘anorexic voice’ that is mentioned throughout the academic literature (e.g. Pugh & Waller, 2017). This makes it categorically different from its predecessor To The Bone which failed to make the distinction between person and illness, resulting in some messy psychological undertones. The most remarkable part of Overshadowed is how it subtly turns up the intensity with every episode. I watched all eight consecutively in one sitting and it still felt like an achingly slow-burner. The National Centre for Eating Disorders notes that in anorexia 'one [stage] melts into the other quite fast.' Imogene begins with almost no signs of an eating disorder and then spirals rapidly into anorexia, her illness gaining momentum with each episode. However, importantly, the depiction of her eating disorder never goes too far. It focuses on the emotional and psychosocial effects of her illness (her relationships start to crumble, she does badly at school, she dabbles with drugs) rather than the physical – which is in no doubt easier to capture on screen. This ensures that the portrayal never strays into territory that is too explicit. There are no close-up shots of Imogene’s body, no gory scenes of purging or bingeing, and not enough information to inspire mimics. The vlogging style means that we can only see what Imogene grants us access to. This provides us with a very real and very raw account of anorexia, which feels desperately realistic. Based in a slightly scruffy sixth form centre in Leeds, the plot often dips into the social politics of adolescence. Bad hair dye mistakes, first kisses, and boy dramas punctuate the story and serve as welcome contextual reminders. The familiarity of this hit home – less than three years ago I was a sixth former in Leeds. The setting is hauntingly similar and impressively authentic. My review of To The Bone left me feeling 'slightly unsure about why films like this were ever deemed a good idea in the first place.' Overshadowed was, by all accounts, a good idea. - Madeleine Pownall is an undergraduate at the University of Lincoln. She blogs at Thought Bubbles. Pugh, M. & Waller, G. (2017). Understanding the ‘Anorexic Voice’ in Anorexia Nervosa. Clinical Psychology & Psychotherapy, 24(3), 670-676.